The magnificent creation made for us by Our Lord. But we need to beware of Shaitan and his tricks which are aimed at us falling short of being the people of Paradise. The primary context that comes to our mind when we read this verse is our wealth. But, Allah swt wants us to think more deeply as He uses the word “anfaq (spend)” in this verse and not “amwaal (wealth)” here. Our time,resources, intelligence,beneficial knowledge, good manners are all part of our provision from Allah swt. When we have the time, we visit the sick,are cordial to people, share the news of deals in the market, but when we are pressed for time,or going through a tough period in our lives, what do we do? We stop calling people, get irritable. when we feel that the sales are few, we don’t share the news with others, lest we lose out on the good stuff. How much time,money,resources would we lose in making a quick call, or dropping a message or smiling even while rushing?A warm quick hug , donuts for the kids, sharing just one useful information on Facebook , putting one dollar instead of 5 in the donation box. But shaitan tries to trick us by trying his best to delude us painting the false picture of poverty(Surah Baqarah 2:268), or by trying to worry us about losing precious time. “Kazim” literally means to suppress some thing, to close the mouth of a water container and “Ghaiz” means to express an anger in which the blood pressure shoots up. How we felt that surge of heat when some one made a belittling remark at us? or when some one quickly parked in our spot for which we had been patiently waiting? Or when our children just don’t seem clean up or our spouse seems inconsiderate? There are three levels of “anger” with the lowest ranging from, just giving a “look”, to the moderate one being not smiling,and snapping back in retaliation , banging doors, yelling , stamping feet being the highest level. Bitter words escape our mouth, wrongful actions are done by our limbs. And in the end, all that is left to gain is deep regret. Shaitan does not want us to control our anger. He strokes our ego and fuels our emotions , so that we ,instead of letting go of that remark , we snap back in anger. Instead of moving on in that hurtful situation, we stay and fume, some times planning our revenge in anger, wasting both our time and energy. But what does Allah swt want us to do at this time? “Afeen” in the arabic language is made up of the huroof, win , fa , wow. These words mean, to to obliterate without any traces, forgo,forgive. We see a beautiful selection of words by Allah swt here again. Instead of using the word “ghafireen” which means to “ protect, cover over, hide, forgive. And forgiveness in the english language means “ the act of escaping a mistake or offense”. Allah swt wants us not to just forgive, but to forgive in a manner, that obliterates all traces of the incident in our minds. So that we don’t hold any ill feelings in our hearts for the people who have been unjust to us. Shaitan, will try to fuel our emotions of hurt,anger, sorrow by reminding us about the incident again and again. The key lies in consciously forgiving the person ,doing once’s best not to let oneself dwell in that incident and focusing on the reward that one gets for doing this. Allah swt loves those people who forgive and HE forgives them their sins. What can be better than His love and His forgiveness? What we have to contemplate about is, “ what is more valuable to us, His love and forgiveness Or our anger and revenge”? If the former is more precious to us, then the it is inconsequential whether the person deserves our anger and pardon or not. The ten days of Dhul Hijjah have begun. 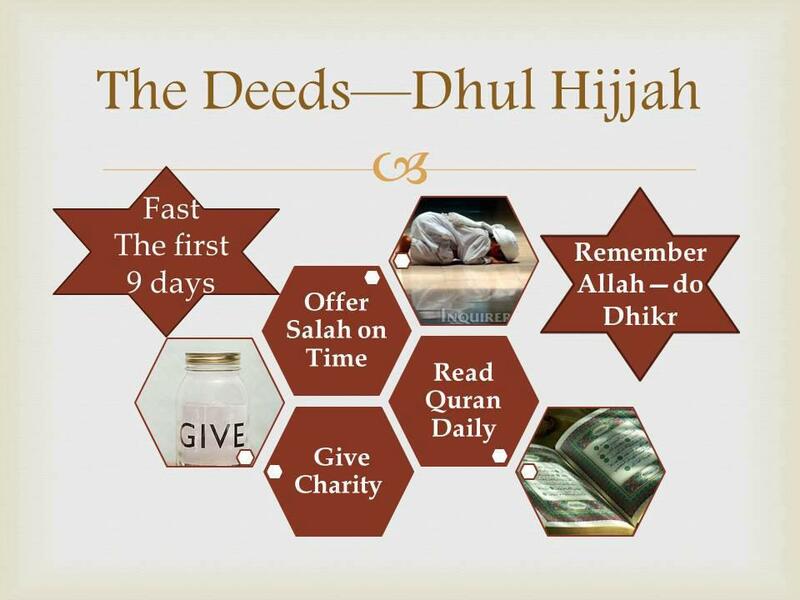 These are the most blessed days of the year, so increase your good deeds in them. 1) The most noble of deeds in these days is the Hajj. 2) Increase your dhikr: the takbeer, and tahleel, and tasbeeh. 3) Read more Quran than usual in these days. 4) Give charity: sponsor an orphan, or build a well, or feed a poor person. 5) Fast, especially if you are not going for Hajj, on the 9th of Dhul Hijjah, for it forgives the minor sins of the year before and the year after. And remember to make dua for all Muslims around the world. May Allah make us of the righteous and forgive our sins, Ameen! The quintessential needs for survival of a human being are food, clothing, shelter – and the Qur’an. We are all born with a basic fitrah (disposition). Worshipping Allah I is embedded in our fitrah and hence the Qur’an is a basic need of our children. If we don’t fulfil it, we deprive them of something vital for their growth. We might not be able to provide the best food for our children, or the best clothes, or a house with a back yard, but we can provide our children with the best access to the Qur’an. How can we gather all the resources that Allah I has given us to feed the hearts of our children with the Qur’an? The first step to attaining a goal, solving problems or completing a task is du’a. Time and again Allah I has shown in the Qur’an how the Prophets made du’a first. In the Qur’an (Al-Furqan:25-28), we are told how Musa u landed in Madyan and didn’t have a place to sleep or food to eat, and only had the clothes he was wearing. He made du’a and in the next few hours, he was provided with a job, a house to stay in and a wife. Rabbi j‘alni muqima salaaati wa min dhurriyati rabbana wa taqqabal du’a. My Lord! Make me keep up my prayers and from my offspring (too) Our Lord! And accept my prayer (Ibrahim:40). O my Lord! Grant us in our wives and our offspring the joy of our eyes and make us guides to those who guard (against evil) (Al- Furqan:74). (Surah Raad), which was very exciting for my six year old! guarantee that it works. SubhanAllah! and other online resources for interactive activities to get going. her and me, and this gives your teaching a personal touch. children love crafts and activities, stock up on craft supplies. light of Surah An Nahl! that right now they have Allah’s angels as their learning buddies. them when they sit down to study. There are, masha Allah, many resources available on the internet. your mind is the best resource for you and your kids. your child will ever have. Happy Qur’an time to you! engineering and a Masters in Business Administration. writes regularly for productivemuslim.com and islamiclifestyle4u. Nuh(as)–the plight of a father..
the plight of a father..
close your eyes and feel the pain,the grief, the desperation of nuh(as) as he tried to reason with his son and the waves came between them..
i cant.. i dont want to..i dont have the strength that Nuh(as) had.. This was the Prophet of Allah swt, His first Messenger to His creation. it can happen to me too.. to you too..
make a dua for your children now, today, everyday of your life..
and (also) from my offspring ,our Lord ! may Allah swt make us and our generations to come from among His righteous servants ameen.